The lovely ladies of an artists collective called The Phoenix Fridas are finishing up their monthlong show at Vision Gallery in Chandler. You don’t have to be a Frida Kahlo fan to admire the work, but hey, you might just become quite infatuated with this enigmatic folk artist from Mexico, who sticks in most people’s minds as the troubled wife of muralist Diego Rivera. She was much more, of course, and the Phoenix Fridas celebrate her spirit with their own individualized paintings, mixed media works, ceramics and installations. The “Crafty Chica” Kathy Cano Murillo, one of the founders of the group, is represented in the show with Warhol-style panels of Kahlo’s familiar face and with “nichos,” or mini-altars framing Kahlo’s image. Anita Mabante Leach offers some excellent textile pieces, and Emily Costello draws from the vibrancy of Kahlo’s art to create several stunning paintings. Also on hand is jewelry, wine bottles with Frida stencils, and miscellaneous crafts that are quite affordable, if you are in the mood to buy art. My short review of the show appears in this week’s Visual Art Source online newsletter. Get the particulars on The Phoenix Fridas show at Vision Galleryby following the gallery link. 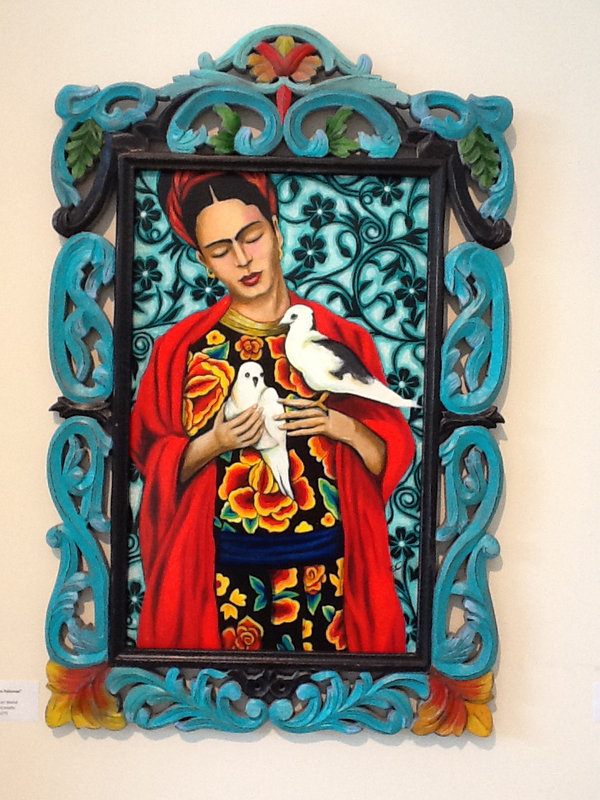 “Frida with Doves,” acrylic on panel by Emily Costello of The Phoenix Fridas. Image courtesy of Vision Gallery, Chandler, AZ.